A recent study, conducted researchers from the UK and Swiss shows that information about heartbeat can be used to change how people experience their own body and self and more specifically that a visual projection of human heartbeats can be used to generate an “out-of-body experience”. 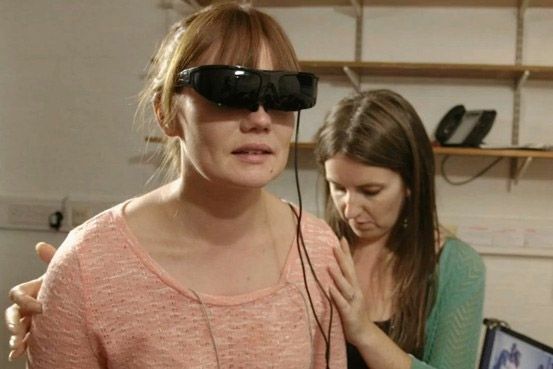 In the study, conducted by Jane Aspell of Anglia Ruskin University in the UK and Lukas Heydrich of the Swiss Federal Institute of Technology in Lausanne, volunteers were fitted with a head mounted display (HMD), used as “virtual reality goggles.” They were filmed in real time by a camera connected back to the HMD, which allowed them to see their own body standing two meters in front of them. The volunteers’ heartbeat were recorded using electrodes. Each heartbeat was timed to coincide precisely with a bright flashing superimposed on the virtual body shown to the volunteer on the HMD. After several minutes of watching the virtual body and their own projected heartbeat, they reported feeling like their virtual body was their own body. They also reported feeling that they were at a different location in the room than their physical body (closer to their virtual self location), and they experienced touch at a different location to their physical body. According to Dr. Aspell: “This research demonstrates that the experience of one’s self can be altered when presented with information about the internal state of one’s body, such as a heartbeat. This is compatible with the theory that the brain generates our experience of self by merging information about our body from multiple sources, including the eyes, the skin, the ears, and even one’s internal organs”. Dr. Aspell believes that the research might help people suffering from self-perception problems, such as anorexia and body dysmorphic disorder. Although not mentioned by the researcher, the findings could potentially be used as the basis for a biofeedback type “game” which can help reduce stress and maybe even achieve deeper meditation. More information about the research can be found on the Association for Psychological science website. Fighting Viruses with their Own Weapons Sea Lamprey’s Genome Mystery DNA ‘Origami’ The Next Step in Evolution? Biological Clock Operate on a 24-hour Cycle?